A small battery life combined with every expanding features spells trouble for smartphone users across the board. Battery longevity is still a major issue with Android phones of all shapes and sizes. There’s always something sapping your battery life without you being aware of it. The built-in power controls widget on your Android is meant to prevent any necessary battery use, but it fails to control all energy-consuming processes on your phone. Extended Controls act as an expansion pack to your regular power widget with a complete package of various controls and widgets. Keeping control without any extra hassle – that’s what Extended Controls is all about. Creating and controlling widgets is supposed to be much easier with this Android app. Find out if that’s actually true in our test. There are enough widgets to keep everyone happy. Choosing the right widgets depends entirely on your personal tastes and preferences. And let me tell you, the selection is amazing. 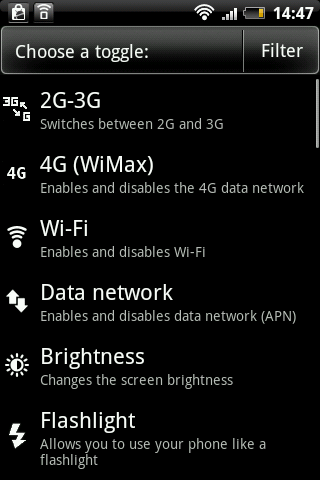 Extended Controls includes widgets for every possible setting on your phone. The list is almost endless and has something practical for each and every Android user. A ton of functions – means a whole load of new possibilities. A particularly useful feature is the Shortcup App. Here you can have an app appear as a widget on the home screen. The ability to quickly access the Media Scanner is also very advantageous. The volume manager opens up a new window that includes all your volume settings in one place. Rebooting and shutting down your phone only makes sense for users with rooted devices. 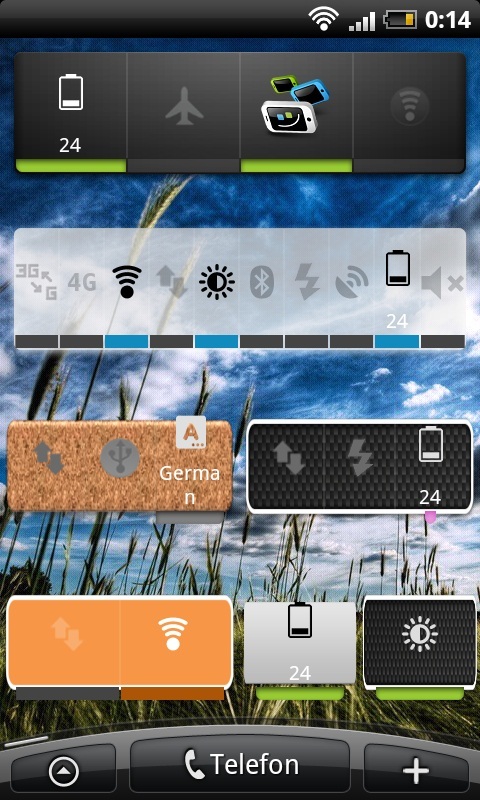 Easily adjustable widgets for brightness, battery and WiFi all deserve a great deal of positive recognition. The customization options of this Android app are nothing short of spectacular. Starting with the background picture and ending with the icon selection – there’s something here for everyone. Make your widgets transparent, download background pictures or icon packs (only 2 currently available from the Market) and make your widgets look perfect to your eye. It’s even possible to adjust the color and size of various indicators. If you need to adjust a widget, just select the Modify button to rearrange things to fit your needs. Accidentally deleted all your widgets? Not a problem! With Extended Controls you can create profiles that can be saved with all your fully customized widgets. You can switch between these profiles whenever you like. What else is out there on the market? There are a lot of random apps out there on the Market, but there only a couple that really stand out: Power Control Plus (widget), EasySwitch (Pro), Widgetsoid and towering above the rest – SwitchPro Widget. To be honest only the last app can really compete with Extended Controls. None of the other apps have as many functions and options as Extended Controls. The long list of widgets, the amount of various designs and its user friendliness make Extended Controls a real must-have! The various customization options are there to cater to your imagination. Select from available background images or use your own photos. Download more icon-packs online for more variety and styles. A preview shows you what your widgets will look like before you activate them. That’s the basic set of controls you’ll need to use Extended Controls. You select the elements that you wish to be listed on your widget bar, but you can move its location by simply drag’n’dropping wherever you have space. The performance speed of Extended Controls is alright, but the app can start to lag if you create too many widgets. The app crashed when I tried adding a 17th widget to my profile. Obviously, most people shouldn’t experience these difficulties because I doubt anyone in their right mind would fill their homescreen with all 17 widgets. Extended Controls can be downloaded for €0.79 (~$1.14) from the Google Market. Pretty cheap for a good and reliable Android app. Widgets are very useful and practical!